So cute. He was a handsome guy, even back then. Starine wrote: So cute. He was a handsome guy, even back then. And big, he's a big guy! On Facebook they celebrated A. P. Indy's 25th birthday (March 31, 1989) by posting this photo of the great horse as a foal. What a baby! And she looks like a pistol too. 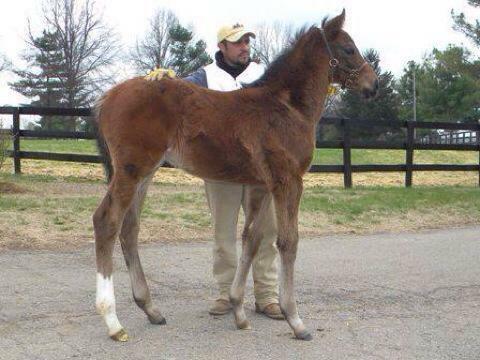 DanLewis wrote: Well I figured another few baby pictures: How about the new mom Havre De Grace! Well here she is as a baby alongside her dam. Both HDG and her dam are gorgeous. Oh gosh, what a doll! Sparrow Castle wrote: On the Spectacular Bid Facebook page is a color photo of Seattle Slew as a newborn, foaled on February 15, 1974. Happy Birthday, Baby Huey, we will never forget you! We can't ever forget him...his blood is in the majority of all runners today! He will always be my fav success story. From his days on the track to the shed. Slew was the man. Recent Eight Belles Winner, Fiftyshadesofgold as a foal. DanLewis wrote: Recent Eight Belles Winner, Fiftyshadesofgold as a foal. Is Tonalist a gigantic foal or is that a tiny handler? Della wrote: Is Tonalist a gigantic foal or is that a tiny handler? Someone at Clement's barn today told someone I know that he's 17 hands. Speightstown even had a giant engine when he was a foal! Izvestia wrote: Speightstown even had a giant engine when he was a foal! Ha- that's what I thought!